There are three new Grocery offers from SavingStar available from today. 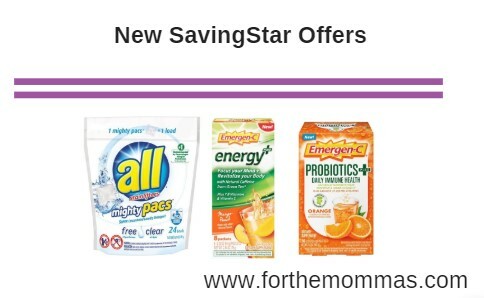 You can save up to $6.00 on all, Emergen-C with the newest SavingStar offers. Save $1.00 on any ONE (1) all® product. (Excludes trial/travel size. ).Expires 9/11/2018.Save $1.00. Save $1.00 off ANY ONE (1) Emergen-C® Product (8ct or larger)..Expires 9/30/2018.Save $1.00. Save $4.00 off ANY ONE (1) Emergen-C® Probiotics+ Dietary Supplement (30ct size)..Expires 9/23/2018.Save $4.00.